A few quick thoughts on recent developments. Hau Lung-pin has apparently decided on running Taichung 7 (Taiping and Dali). In thinking that it could be a good district for him, he is probably looking at a few things. First, there is a small concentration of former military voters in Taiping. There used to be about (very roughly) 10,000 votes in military villages. These old-style villages don’t really exist any longer. Many of the old guys have passed away, and the housing has mostly been torn down and rebuilt into high rises. In the transition, lots of outsiders have moved in, and lots of former residents have moved out. Still, many of the old second and third voters still live in the area. Second (and related to the first), this was the old political base for former New Party, PFP, and KMT legislator Feng Ting-kuo 馮定國. Hau probably expects he can build on Feng’s old networks. Third, Ma won this district in 2012, 51-46%. Actually, that’s the problem. Ma won every district in Taichung in 2012, but Taichung seems to be changing fairly fast. Basing expectations on what happened four years ago, much less ten or twenty years ago, is likely to lead Hau to an unhappy ending. Former KMT legislator Chang Shuo-wen 張碩文 has announced that he will run for the PFP in New Taipei 3 (Sanchong). Chang was elected in Yunlin 2 in 2008, but his seat was stripped in a vote-buying case. The DPP won the by-election and seems to have Yunlin 2 sewn up for the foreseeable future. New Taipei 3 is a bit more competitive than Yunlin 2, but that isn’t saying much. I didn’t expect the KMT to mount a serious challenge, and if the PFP is splitting the vote it will be nearly impossible to defeat the DPP incumbent. Why would Chang think that New Taipei 3 is promising? Sanchong has a sizeable population of migrants from Yunlin, and they have a very active hometown association. This is not the first time a Yunlin politician has decided to jump start a career by running in Sanchong. Most famously, Lee Ying-yuan won a few terms as legislator in Sanchong, but his ultimate goal always seemed to be Yunlin County magistrate. Personally, I think politicians consistently overestimate how powerful these hometown associations are in mobilizing votes. At any rate, the most interesting thing about this story is a little throwaway line in a Storm article (that I don’t have time to look up now, sorry). Apparently Chang thought about going back to Yunlin, but former county magistrate Chang Jung-wei 張榮味 is very close to Soong. Chang Jung-wei ad some other plans, so Soong discouraged Chang Shuo-wen from running in Yunlin. That vague statement makes more sense after the Yunlin 1 incumbent Chang Chia-chun 張嘉郡 (Chang Jung-wei’s daughter) threatened to withdraw from the KMT if Hung Hsiu-chu is nominated. I’m very interested to see how this develops. It’s hardly news that Hung Hsiu-chu’s first couple of weeks as the presumptive KMT presidential nominee haven’t gone well. She has insulted the USA, slapped down Chairman Chu, made several extreme statements, and given very little impression of having prepared for a presidential race. (In fact, she admitted as much, stating that during the Lunar New Year holiday, she had decided to retire. In other words, rather than methodically mastering policy briefs for three or four years, she slapped the entire effort together over the course of the past few months.) Still, I did not think that there was any serious thought inside the KMT about Plan B. After all, she won (what everyone interpreted as) a smashing victory in the polling primary, and the party closed ranks around her. As of Thursday, however, I’m no longer so sure that the nomination is decided. Four things have happened in the past week to give me pause. They may mean nothing, or they might collectively be indicative of deeper scheming. I dismissed the first three, but the fourth one seems potentially devastating. It is has the least evidence behind it. Again, this might all be nothing. First, in this week’s KMT Central Standing Committee, Wang supporter Lin Jung-teh 林榮德 openly blasted Hung, saying, “She hit the USA with her left fist; she hit Wang Jin-pyng with her right fist; she tripped up Eric Chu; and she was ‘New Partyizing’ the KMT so that it might become a small party after next year’s election.” This is pretty open and hostile stuff coming in the KMT’s official forum. They should be producing statements about party harmony and unity, not publicly airing this sort of internal conflict. Still, we could overlook this as simply sour grapes from a bitter nomination fight. Second, a talk show host, Wen Shen 溫紳, accused Hung’s father of informing on others during the White Terror. Hung has spent the past few weeks stressing her family history. Her father’s experience as a White Terror victim is a central part of her desired image as someone who did not grow up in privilege, and it is supposedly the source of her deep sense of justice and righteousness. Her entire career is presented as a validation of her father’s innocence. Now this story calls into question her father’s innocence. If he was an informer, he is a far less sympathetic character. Again, we could just dismiss this story as an isolated incident. Maybe Wen Shen is a really smart researcher and just happened to look in the right place. Third, famed media scandalmonger Clara Chou accused Hung of getting a fake Masters degree. Hung received a MA in Education Administration from Northeast Missouri State University in 1991. As far as I can tell, this is an unjustified accusation. The diploma looks real to me, and (now renamed) Truman State University is not questioning its veracity. Chou is now questioning whether Hung had enough credits, but that is a matter for Truman State, not Chou, to decide. She is also questioning the meaning of “non-certified.” I think this simply means that Hung did not receive a teaching certification and is not accredited to teach in Missouri. That shouldn’t affect the validity of the MA. It looks to me like the diploma is authentic and Chou’s accusations are unwarranted. On the other hand, what is pretty clear is that Hung got a lousy degree from a lousy program in a lousy university. Apparently she only needed to study for one summer and amass a very low number of credits to get the MA. That seems extremely lax. Moreover, one of her classmates has helpfully clarified that they actually did study there, and they even hired a tutor to help them when they couldn’t understand the English content. That doesn’t sound reassuring. (He is currently the vice-president of Taiwan Sports University; I wonder if that school might be reconsidering his qualifications!) As for Northeast Missouri State, many Taiwanese may not be familiar with the pecking order in American public universities. A rule of thumb is that you discount the quality for every word other than the state name. For example, Florida State and Michigan State are not quite as good as Florida and Michigan. “State” is often a relatively small discount. Direction words are bigger discounts. Western Washington, Southern Mississippi, and Northern Arizona are a big step down from Washington, Mississippi, and Arizona. Northeast Missouri State has three discounts in the name, which does not suggest excellence. This is probably why they changed the name to Truman State. In sum, Hung was probably accused unfairly, but we have learned that her formal training in her supposed field of expertise is extremely shaky. Anyway, I suppose this could also be just another isolated incident. Perhaps Clara Chou stumbled on this story all by herself. Fourth, yesterday as Hung was leaving an event, an unidentified reporter shouted out a question asking whether Hung had speculated in real estate in Shanghai. As far as I can tell, there is no evidence for this question. Someone simply threw it out in the open for it to hang provocatively in the air. Hung doesn’t seem to have responded to the question, and other media outlets have not reported the story extensively. It is, at this point, a completely unsubstantiated rumor. However, if this rumor develops into something more tangible, it could be devastating. Hung has not reported any Shanghai real estate on her official statements to the Control Yuan, so at the very least, she would be guilty of hiding wealth. Moreover, if she were speculating in real estate, this would destroy her attempts to frame herself as the poorest presidential candidate in ROC history (running against a candidate with substantial inherited wealth). Most importantly, if she is making big profits in Shanghai, can she be trusted to represent Taiwan in negotiations with the PRC? It is reasonable to wonder if the PRC aids or guarantees Taiwanese politicians from the blue camp when they invest in China. Has she been bought? Remember, there is no evidence for any of this so far. The point here is merely that this rumor could be devastating to her campaign if there turns out to be any truth to it. Once is a happening. Twice is a coincidence, Three times is a pattern. Reporters might have independently investigated the diploma, her father’s behavior 60 years ago, or her investment habits. However, Taiwan isn’t famous for great investigative reporting. Usually someone tips off the reporter. It isn’t likely that the DPP is behind this. For one thing, if the DPP had damning info on her, they would want to wait until after she becomes the official nominee. Ruining her now could mean that the KMT switches to a much stronger nominee. For another thing, these are not the types of info we would expect the DPP to be able to dig up. The DPP has an interest in the history of the White Terror, but this case involves mainlanders informing on other mainlanders. This is not the type of case that DPP types would have paid as much attention too. The people most likely to remember the details of this case are the family members of the people involved or the people who were working in the security systems that processed the case. Those people are highly unlikely to be DPP sources. Similarly, the PRC is unlikely to feed the DPP information on Hung’s investments in Shanghai. No, this has the fingerprints of an internal KMT struggle. Evidence from the White Terror and about financial dealings in China most likely comes from the intelligence networks. It would not be surprising at all to me if they had opened up their files (perhaps on request from above) and informally fed dirt to the highest levels. Those highest levels would then make the decision on what to feed to the media, again through confidential, informal, and untraceable channels. It could be that Hung Hsiu-chu has successfully performed her assigned task, to block Wang Jin-pyng. Now that Wang has clearly been rejected and Hung seems quite unsuitable for the job of presidential candidate, perhaps President Ma is moving to replace her with someone more stable and better prepared for the presidency. Is it time for Wu? I seem to be writing these sorts of speculative posts all the time these days. This is blogging at its most irresponsible and unaccountable! If you think I’m way off base, you’re probably right. In my last few speculative posts, I suggested party alignment might be possible, Chu was about to run, and Hau would run in Taichung 6. That makes me zero for three. This one will probably make me zero for four. I promise I’ll eventually get around to writing something more concrete and respectable. In the meantime, I’ll be watching along with everyone else to see if the KMT nomination contest actually does go into overtime. Taiwanese politics wouldn’t be nearly as much fun if they weren’t so outlandish! What effect will Hung Hsiu-chu’s nomination have on the KMT vote? This is an unanswerable question, of course. We don’t know what Eric Chu or Wang Jin-pyng would have gotten if they had won the KMT nomination. We don’t really know the state of public opinion in national politics after 2012, except that we have a notion the KMT has lost some ground. Still, let’s make a lot of wild assumptions and see where they take us. Remember, you can dispute almost every step of the following exercise if you want to, so take all of this as merely one of many possible outcomes. Hung Hsiu-chu is from the True Believer wing of the KMT. It is hard to know exactly what sort of strength this wing has since the deep blue and light blue votes always get mixed up together. Perhaps the best indicator comes from 20 years ago, at the height of the New Party’s popularity. In 1995 and 1996, the New Party was solidly established as the vanguard of ROC nationalism. Moreover, it was also labeled as a Taipei party and a Mainlander’s party. Unlike James Soong and the PFP, the New Party never figured out how to speak to the KMT’s local factions. I have a hunch Hung Hsiu-chu might face the same constraints over the next several months. There are three good measures of New Party support: the 1995 legislative race, the 1996 National Assembly race, and the 1996 presidential campaign of Lin Yang-kang and Hau Pei-tsun. You might object that Lin was an established Taiwanese politician with deep ties to localized forces, and you would be correct. However, in 1996 the KMT’s local factions – except those in Lin’s home Nantou County – all sided with Lee Teng-hui. Lin had to bring in Hau to consolidate his strength among the non-Mainstream faction, and this further alienated the local factions. As one of my mentors memorably put it, Lin plus Hau equaled Hau. Hau was not a New Party member, but the party formed to support him against LTH and his son was a New Party legislative candidate. From the following table, you can see that the three measures of New Party strength 20 years ago were fairly consistent from county to county. The New Party never monopolized what was later labeled as the Deep Blue vote. Some ROC nationalists remained in the KMT. Hung Hsiu-chu is a classic example. She was always friendly with the New Party (and later with the PFP), but she never left the KMT. Let’s make another wild assumption here and guess that the New Party vote represents 2/3 of the overall deep blue faction. If you take the highest of the three New Party measures (Lin/Hau’s 14.9%) and multiply it by 1.5, that implies a total deep blue vote of 22.4%. Of course, this would have varied from region to region. 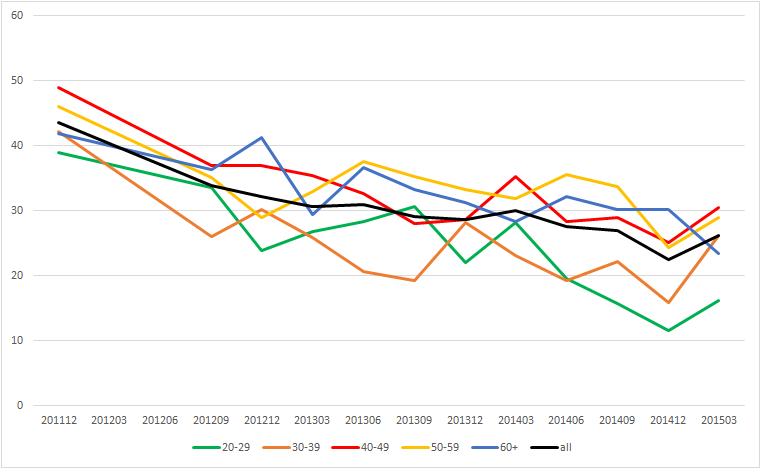 It also might have changed a bit in the past 20 years, but we’re making lots of crude assumptions so let’s not worry about that. Next, let’s jump to 2012. Ma Ying-jeou won re-election with 51.6% of the vote, and this is the coalition that the KMT will be trying to defend next year. (Another assumption: Soong’s 2.8% is not part of the current KMT coalition.) If 22.4% is the deep blue wing, that leaves 29.3% as the light blue wing. I think it is reasonable to assume that Hung Hsiu-chu won’t have much trouble winning all of the deep blue votes. Her challenge will be to win the light blue votes. I’m not optimistic that she can do this as well as Ma did in 2012. So my next major assumption is that Hung will win 80% of the 2012 light blue votes. This would cost her 5.9% of the overall vote, leaving a final total of 45.8%. 45.8% would almost certainly make her a loser, but that’s not the main point of this exercise. The real value is in looking at some of the regional variations and thinking about their implications. If the KMT got 46%, what would that look like in various places? The following table shows the breakdown of deep blue and light blue by cities and counties (using the pre-2010 administrative lines). It is ordered by light blue votes. There are roughly four big categories. 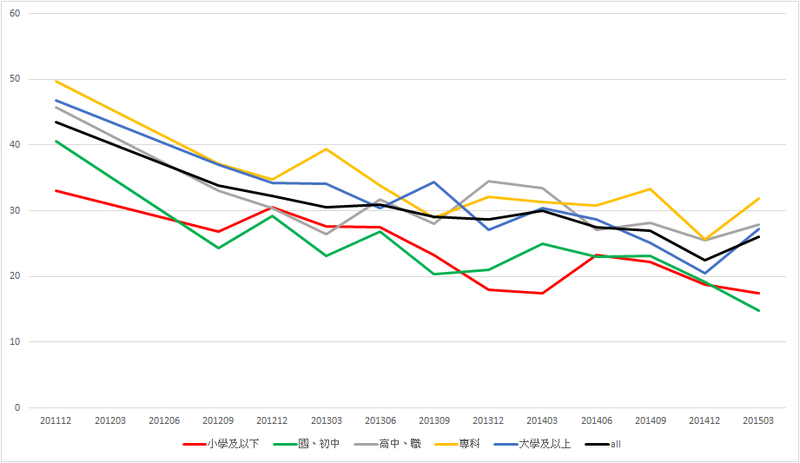 Taipei City is alone at the top of the chart. (I am ignoring Kinmen and Matsu.) Only 15% of Taipei’s voters are light blue, by far the smallest proportion of any city or county. Taipei is highly polarized, with 42% deep blue, 42% green, and only a small (but decisive) proportion of light blue voters. 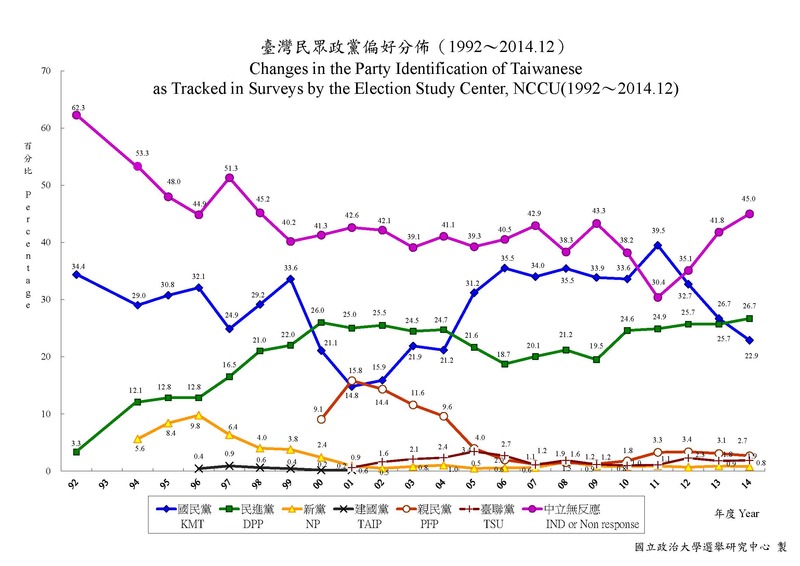 If it seems that election results in Taipei are less volatile than everywhere else in Taiwan, this might be why. Hung’s nomination will not hurt the KMT much at all in Taipei since there are very few light blue voters to alienate. 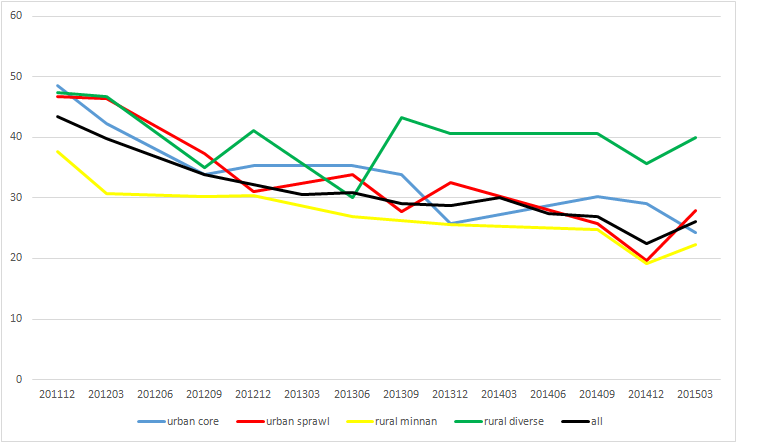 The second section, from (the old) Taichung City at 20.2% to Taoyuan at 29.6%, includes most of the other highly urbanized areas in Taiwan. These urban areas have lots of votes, and they have roughly as many deep blue voters as light blue voters. The third section, from Kaohsiung County at 29.8% to Changhua at 37.8%, covers most of the rural areas in central and southern Taiwan. In these areas light blue voters outnumber deep blue voters by about three to one. Finally, the four counties at the bottom of the table are located in the northern Hakka heartland and on the east coast. These areas have high proportions of Hakka and Aboriginal voters. These areas have always been reliable KMT strongholds, but Hakkas and Aborigines were never part of the New Party coalition. Hung can probably win over these votes, but she might need to spend a lot of time in these four counties to get that done. The election will be won or lost in the second and third sections, which hold most of the country’s voters. Hung will be tempted to spend most her time and energy in the second group, which has a lot of deep blue votes. It is always more fun to preach to the choir. However, if she is serious about this election she will concentrate on the light blue voters, and that suggests she should spend a good amount of time in the third group. It will be interesting to watch where she goes over the next few weeks. We can take this exercise even further. What if we extend this methodology to individual electoral districts? Of course presidential votes don’t translate directly into district votes, but neither are they completely unrelated. There are a couple of different ways to think of this. On the one hand, you might think of these numbers as the KMT presidential vote in the district. That is, a candidate running in a particular district has a certain partisan advantage (or disadvantage). The specific candidates in the race then build upon that base with their personal appeals. A candidate facing a big partisan deficit needs to build up a powerful personal appeal to overcome the partisan handicap. A candidate with a partisan advantage has a cushion of safety. On the other hand, you might think of this as an indication of district candidates losing an average of 20% of the light blue vote. In this case, we might imagine that Hung is actually losing 30% of the light blue vote, but that the average district vote can pull 10% back. I’m going to present these numbers as if the latter is the case, but you can think of them either way. Remember, these are not so much hard predictions as an effort to see vaguely how Hung’s candidacy might filter down to district elections. The numbers in this section are a bit sloppier than in the previous section because I am lazy and wanted to save time. I used the Lin/Hau results instead of taking the maximum of the three races. Also, I did not bother to divide up townships. For townships that are split between two legislative districts (eg: most of Zhongli is in Taoyuan 3 but a minority is in Taoyuan 6), I put the whole township in the legislative district with most of that township (eg: all of Zhongli is placed in Taoyuan 3). Finally, I only looked at a subset of districts. I am most interested in districts that the KMT won in 2012 but that have a chance of changing hands in 2016. This is not an exhaustive list. The Nantou districts are omitted because Lin’s vote did not represent New Party strength; three southern districts are omitted because the DPP already has a clear partisan edge, and the Taipei districts are missing because they completely ignore administrative district boundaries. Still, I think these figures are interesting. Remember, the DPP has to flip at least 12 seats to win a majority. They should easily flip Chiayi 1, Yunlin 1, and Kaohsiung 9, but the KMT should probably take back Taitung. So the DPP’s goal is to flip at least 10 other seats. This table shows the KMT under 50% in 19 seats that they currently hold (marked in red). A few are very close to 50% (four are above 48%), so it is by no means certain that the DPP could sweep these 19. Alternatively, 13 of them have the KMT with less than 46%; 4% is a big deficit to make up. In this version of the future, the KMT gets decimated in Taichung and Changhua, falling from 8 to only 2 of the 12 districts. 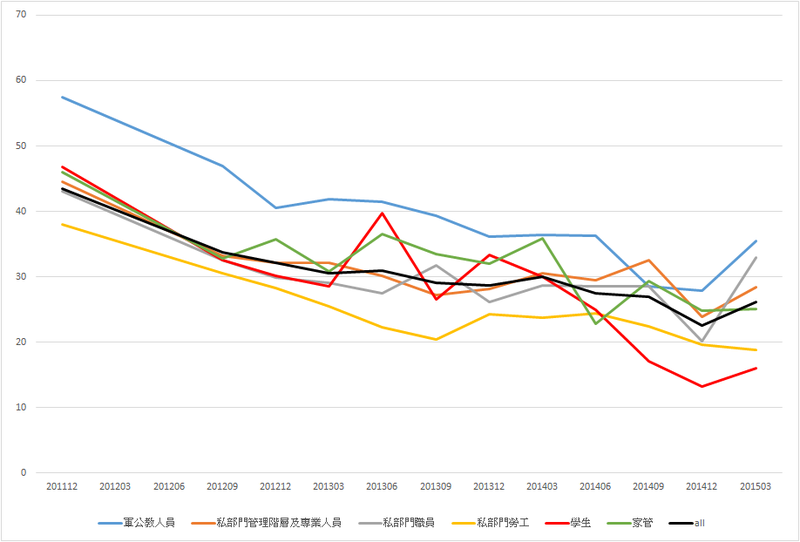 It also suffers heavy losses in New Taipei and, incredibly, Taoyuan. This is all very sloppy, and it rests on a stack of tenuous assumptions. However, if Hung Hsiu-chu really does drive the train off the cliff, this is what it might look like. Former Taipei mayor and current KMT vice-chair Hau Lung-bin wants to run for the legislator. That means it’s time to play everyone’s favorite game: Find a Suitable District! Most of the districts are already taken, so Hau has to choose from whatever is left. He is apparently looking for a somewhat difficult but winnable district so that he can claim to have done a great service for the KMT. Such a victory might catapult him into the next stage of his career, whether that is as LY speaker, KMT chair, or 2020 presidential candidate. He originally said he would go to the south, but not he has said that he won’t necessarily do that. He claims to want a district where the KMT has about 40-45%. Actually, those districts aren’t winnable. What he really wants (and what he seems to be looking at) is a district where the KMT has about 47%. So, what are his choices? Chiayi City. (2012 Ma: 46.3%). Chiayi City is almost exactly what Hau is looking for. It is deep in the heart of the south, yet it is urban and has a fairly strong core of KMT votes. Former VP Siew famously proved his electoral mettle in Chiayi City in 1995, a victory that propelled him toward the premiership and vice-presidency. There is but one problem. Fellow KMT vice chair Huang Min-hui 黃敏惠 is from Chiayi City. Since the KMT is asking its top leaders to run, she is almost certain to get the nod here. Tainan 4. (2012 Ma: 46.4%). Since the KMT has already finalized its nominations in the winnable parts of Kaohsiung, this is the only other plausible district for Hau in the south. Tainan’s East District is the home of National Chengkung University and all the deep blue voters associated with it. This is the block of voters that gave the PFP a seat in 2004, and Ma actually broke 50% in this district in 2008. However, there is again the problem that this district might not be open. Su Chun-bin 蘇俊賓 ran very well here four years ago, and the presumption was that he would run again. In order for Hau to run, he needs to find another district for Su. The media rumors were that Su would go to Keelung, but there are problems with that as well (see below). Moreover, this district might not be as promising as it appears. The south has been trending greener and greener over the past few years, and half of this district (the South District) is not fertile ground for a candidate like Hau. Also, Su ran well last time in part because the DPP nominated a tired and not terribly popular candidate, former mayor Hsu Tain-tsair 許添財. They have a bright fresh face this year in Lin Chun-hsien 林俊憲, and he should be a stronger candidate. Keelung. (2012 Ma: 59.3%). Sure, the DPP just won the mayoral race, but look at Ma’s vote. Keelung is supposed to be a blue city. Winning it wouldn’t really raise Hau’s status very much. Also, Keelung already has a bunch of local people lined up fighting for the nomination. Last year’s debacle occurred in part because the KMT tried to parachute in a candidate from the central government and ignored the local people. I think they might yield for Hau, but they might not yield to Su Chun-pin. Taipei 2. (2012 Ma: 47.3%). I think this is a real possibility. Everyone thinks this is a solid DPP seat, but it actually isn’t overwhelmingly green. Hau wants to get out of Taipei and raise his national profile, but he might be steered back to Taipei by party forces desperate to win seats. As I understand it, the local candidate in line for the nomination is former city councilor Chen Yu-mei 陳玉梅. She is a good candidate with deep roots in Datong. However, most of the voters in this district are in Shilin. Hau would probably be an upgrade. New Taipei 2 and 3. (2012 Ma: 45.9% and 46.0%). I don’t think these are good targets for Hau. These two districts (Sanchong and Luzhou) are mostly working class, with lower education levels, and with very few mainlanders. Lin Shu-fen 林淑芬 is a very popular incumbent in New Taipei 2, and it is highly unlikely Hau could beat her. Kao Chih-peng 高志鵬 might be a bit more vulnerable in New Taipei 3, but I think Hau should probably look elsewhere. Taichung 7. (2012 Ma: 50.7%). Ho Hsin-chun 何欣純 is the DPP incumbent in this district (Taiping and Dali), which has seemingly taken a sharp turn toward the DPP in the past few years. This district is fairly similar to New Taipei 2 and 3. Much of it is hastily overbuilt neighborhoods for working class people priced out of the more desirable Taichung neighborhoods. Again, Hau should probably pass on this one. Taichung 6. (2012 Ma: 51.7). Ah, here it is. This district is downtown Taichung. Lin Chia-lung 林佳龍 won it in 2012, and Huang Kuo-shu 黃國書 won the by-election earlier this year. People are starting to think of this as a green district. Still, it has a solid base of KMT voters, and it has lots of neighborhoods with the more upscale voters that Hau can appeal to. I haven’t heard of any KMT city councilors openly vying for the nomination, though I’m sure someone would be willing to take it. If Hau wants to run here, it is probably as open as any other desirable district. If I were Hau, my eyes would be focused squarely on Taichung 6. Solidarity.tw has written a couple of posts looking at Hung Hsiu-chu’s 1995, 2001, and 2004 election results. He did not look at her 1989 and 1992 results since those are not listed on the Central Election Commission website. Luckily, I just happen to have those missing data, just in case he or anyone else wants to look at the earlier elections. The Election Study Center’s website has the 1992 data. I have put the 1989 data into a handy-dandy spreadsheet. For non-Chinese readers, Hung Hsiu-chu is the candidate who got 53551 votes. No extra points for guessing which township is her home base of Yonghe. (Candidates marked 國自 were not nominated by the KMT but wrote in KMT under their party membership when registering. In 1989, the electoral law did not require any proof of party nomination, and candidates were allowed to fill in whatever they wished. That changed in 1992 with the introduction of a party list tier.) 1989 Taipei County LY by town Have fun! As we all know by now, Hung Hsiu-chu passed the 30% threshold with lots of room to spare. Her 46.203% average seems to preclude any idea of overturning her victory in the July party congress, when the nomination will be formally determined. Late last week, a few people were starting to grumble about that possibility. Assuming some of her support was empty, coming from strategic green voters, her polls might drop in the coming weeks. The Wang faction would then have an opportunity to use those lower numbers to overturn the polling primary result. However, now that she has convincingly passed, I think the chances of that scenario are remote. At any rate, during the last week it certainly felt like the KMT was coming to an internal consensus in support of Hung. As more and more people came out in support, it felt as if blue supporters had collectively decided that they were fine with the idea of following Hung into battle. Only a minority protested. Wang’s public statement that he might still be in the race was a sign of panic, indicating that he also thought she was likely to pass. If he was going to stop her, he needed to do something dramatic. Alas, it was too little, too late. There is one thing more. How did Hung suddenly surge to 46%? Her numbers hadn’t been that high in any polls. Today I had lunch with someone who knows a little bit about the KMT internal rules. He explained that, at least in the head-to-head portion, the written rules clearly state that the score is A/(A+B). In other words, all the undecided voters are thrown away. The official results were that Hung got an average of 50.76 “support” (Do you support Hung to be the KMT candidate?) and 41.65 “intent” (Between Tsai and Hung, who do you intend to vote for? ), for an overall average of 46.20. That sounds intimidating. Last week, a TISR poll showed Hung with 41% support and 31% intent. However, those are the raw numbers. Apparently the KMT methodology is to throw away the undecided, support for other candidates, and non-responses. Those categories combined for 28% on the support question and 27% on the intent question. If you recalculate, that yields a support rate of 56.2% and an intent rate of 43.06%, for an overall average of 49.61%. That is not too far from Hung’s eventual 46.2%. In fact, if you are willing to assume that Wang Jin-pyng’s last minute appeal had a small negative effect, you can easily get to 46%. From another point of view, what kind of raw support could we infer from the 46.2% final score? The KMT didn’t publish the full results, so we have to make a guess about how many undecideds there were. The TISR rates seem reasonable, so let’s use those. On support, the average for the three survey organizations was 50.76%. Assuming 27% undecided, that implies a raw support rate of 37.1%. On intent, the final average was 41.65%. With 28% undecided, that implies a raw intent rate of 29.98%. The average of those two is 33.5%. 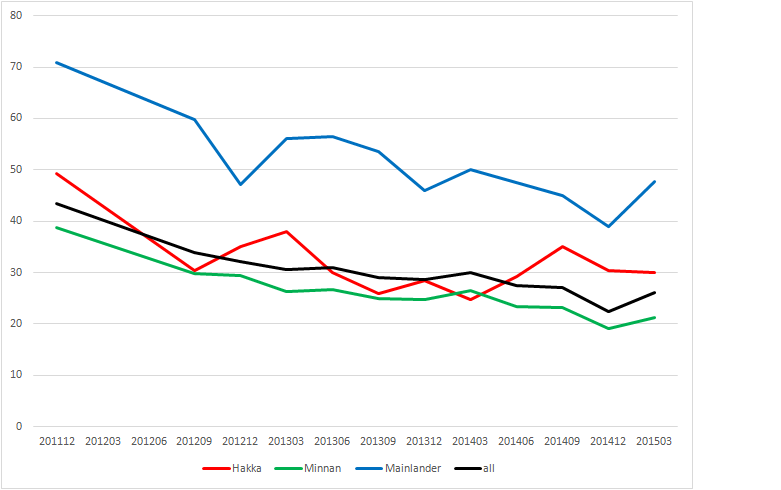 If you assume that undecided rates are higher, those numbers go down a bit. At about 35% undecided, Hung would fall below a raw 30% average. I’m betting that most people think that the numbers released were the raw averages. Those are the numbers that we are used to seeing in survey results. Hung probably passed the 30% threshold with the raw results, but it might have been close. I don’t think this is some sort of “cheating.” The KMT can write its rules any way it likes. In fact, I think that releasing a score of 46.2% instead of something around 33.5% was a wise decision for the KMT, regardless of the rules. As it stands now, the fight has been resolved. If Hung had gotten 33.5%, there is a good chance that the nomination fight would have gone into overtime, with lots of bloodshed and nasty recriminations. Instead, the KMT can now turn to preparations for the uphill fight in the general election. Now that Hung Hsiu-chu has passed the polling primary, it is highly likely that she will become the KMT’s presidential nominee. If that happens, it seems inevitable that this post will get some attention. (Actually, it already has.) While I would prefer for that post to stay relatively obscure, I think I should add some comments just in case it goes viral. I returned to Taiwan in late 2009 to take a position at Academia Sinica, and I started this blog in early 2010. It was a fairly anonymous enterprise for most of the first year. I was still trying to figure out what kind of blog this would be. For example, I experimented with rendering all Chinese names and places in hanyu pinyin, though that turned out to be a disaster. I wanted the blog to be mostly neutral. Of course I have strong personal opinions about Taiwanese politics, but I did not want the blog to shove those views down readers’ throats. I hoped it would be a source that people from all camps would find useful and informative. During those early months when I was still trying to establish a reputation for the blog, I worried a lot about avoiding anything that might be interpreted as openly partisan. At the same time, I was well aware that very few people knew of the blog, and very few people were reading anything I wrote. When I wrote the story about Hau’s campaign rally, I thought it would disappear into the ether just like everything else I had written up to that point. I was genuinely taken aback by the harshness of Hung Hsiu-chu’s speech at that rally. I was not in Taiwan during the Red Shirt movement, and I may have missed a sharp increase in the stridence of the average speech. From rereading the post, it seems the people in the audience had heard it all before and Hung’s tone was nothing unusual. For me, however, it was a jolt. I had never heard that degree of open incivility. The post is an honest representation of my shock at her speech. If I had the opportunity to rewrite the post, I would only change one thing. I would delete the last sentence of the seventh paragraph, which says, “You got the idea that if it were up to her, she might settle on some medieval torture (flaying the skin, burning flesh, breaking bones, all while the victim is still alive) as an appropriate sentence.” That sentence went far beyond what she said. I was trying to be dramatic and evocative, and I went way overboard. The previous sentence, “She wanted pain, not simple punishment.” would have been sufficient. By the way, her comment about “some relief yesterday” refers to a Supreme Court ruling on one of the Chen Shui-bian corruption cases. I’m also amused by my judgment that Hau Lung-pin was in trouble. He eventually won re-election by a comfortable margin. Please remember this swing and miss the next time I’m brave enough to make a prediction. My musing about Ma Ying-jeou hitting his stride was more accurate. Looking back, the year and a half or so between the ECFA debate and his re-election was the high point of his presidency. I had no idea this post would be an internet hit. However, the blogger Echo Taiwan translated my post into Chinese and added an incendiary title, “Garden of Hatred.” His blog, which seems to be inactive now, had a much larger readership than mine. I imagine only a small minority of his readers clicked on the link to read my original English-language version. Even so, it was a veritable deluge for me. That single post got about four times as many page views as I had been averaging for an entire month. Even now when I have a far larger base of readers, that article is still the most viewed post I have published on this blog. You can imagine my horror. I had finally written something that seemed to make an impact, and it was being used as a partisan attack piece! In retrospect, I don’t blame Echo at all. I wrote the piece and published it. Once it was released into the wild, it became fair game for him and everyone else. I should have been more cautious and less sensational. Moreover, I didn’t set out to defame Hung Hsiu-chu. She is the one who gave the strident and incendiary speech. I merely reacted to it, and Echo picked up on my reaction. Hung is ultimately responsible for her speech, and I’m sure she is willing to stand behind those words. She’s not called the “little chili pepper” for nothing. She speaks her mind, and she doesn’t back away from controversy. I’m sure I’m not the first person she has ever shocked, and I doubt my reaction would have bothered her very much. So Eric Chu has announced that he will be missing the KMT Central Standing Committee meetings for the next three weeks because he has more important things to do. Specifically, he has to be present at the New Taipei City Council for interpellations. Well, this is another unexpected twist. Surprisingly to me, many politicians are not calling him out on this obvious ploy. So let’s humor him and assume for a minute that he is telling the truth. I guess that makes him a very conscientious mayor. It also makes him something of a simpleton. On the one hand, it means that he thinks it is much more important to answer routine questions about local minutiae such as whether a particular road in Linkou will be paved in July or August than to oversee a momentous decision that will affect the entire country for the next four years. Moreover, it means he has no sense of flexibility. Mayors take leave all the time from these types of duties. That’s why they have deputy mayors. Besides, didn’t he spend a whole lot of money and political capital to bribe the TSU councilor to vote for his speaker candidate precisely so he could control the agenda of the council? Isn’t this the perfect time for the KMT speaker to decide that it is imperative to interrupt the interpolations on Wednesday morning so that the entire city council can go on a fact-find mission to Wulai to ensure that the recent drought hasn’t affected the mineral levels in the water at all the illegal hot springs resorts? Really, it’s so unflattering to Chu to take him at his word. Let’s give him the benefit of the doubt and assume he is lying for political purposes. I can think of two reasons that Chu might not want to be at the CSC over the next three weeks. First, he might not want to take the blame for killing Hung’s chances at the nomination. He’d rather someone else chair the meetings when they determine that the procedures used ensure she doesn’t pass the threshold and when they confirm those results (or, if she passes the threshold, to accept or reject those results). If this is the case, he’s a spineless, gutless leader. He’s also not very good at hiding his fingerprints. If he wanted Hau to take the blame, he should not have had his man, Lee Si-chuan, overrule Hau’s decision to let Hung have four public forums to present her ideas to the electorate and to hold the polling at the end of June. I don’t think this is the answer. Second, I think he wants to be elsewhere in the third week because that will be the meeting in which the CSC has to decide what to do next. Let’s back up. Hau’s original plan was for the polling to be done in late June, but Lee overruled him and moved the polling up to mid-June. Chu purposely moved the polling up so that the results would be presented during the New Taipei City interpellation. He intentionally created this scheduling conflict so that he would not be in the room on June 17. He must have decided on some strategy for that meeting that requires his absence. This is apparently a fairly recent decision on Chu’s part, because Hau didn’t know about it when he agreed to stretch the polling out until late June. I’m not sure what Chu’s endgame is. My best guess is that he has finally come to the conclusion that he may have to accept the nomination. This would be difficult if he were chairing the meeting because it would require him to recognize a motion putting him in the running and then tacitly accept that idea by not shooting the motion down immediately. It will be much more publicly presentable if he is not there. Hau could accept a motion to hold a poll between Chu, Wang, Wu, and whoever else, with the nomination being offered to the winner. They could even hold the poll immediately. That way, when the poll results are presented to the CSC, Chu will simply be able to bow to the party’s decision and reluctantly accept the burden of the nomination. Everyone saves face. Of course, there is really no need for all this tortuous theater. Chu could have simply announced that he was willing to take on the duty of running for president at any time – including right now – and the KMT would happily have nominated him. Sometimes people overthink things. If Chu still doesn’t want to be the nominee, I don’t know why he doesn’t want to chair the June 17 meeting. It can’t be because he has agreed to let Hau ramrod some decision through. Hau wasn’t privy to the scheduling ruse, or, presumably, to the grand strategy. If he wants Wang or Wu to be the nominee, he would do better to chair the meeting and shepherd that decision through. Frankly though, I have very little confidence in predicting or explaining Chu’s actions because I have no idea what his underlying goals are. Nothing he has done since taking over the party chair has made a whole lot of sense. Maybe we will understand this particular decision in three weeks. Maybe we will still be scratching our heads in confusion. You are currently browsing the Frozen Garlic blog archives for June, 2015.